One of the biggest challenges for marketers is that eyes are drifting to mobile devices from traditional content and media channels faster than new marketing techniques are able to impress consumers of mobile applications, content, and media. According to Meeker, there are 1.1 billion mobile 3G subscribers around the world. Mobile data is one of the fastest technology adoption curves in history with 37% y/y growth. Still, there is just 18% worldwide penetration. This compares to 2.3 Billion global internet subscribers – a number which grew just 8% over the last year. And while there are 6.1 billion mobile phone subscriptions around the world, only 953 million of those today are smartphones – again showing lots of potential for growth. As would be expected, mobile Internet traffic is growing at an amazingly fast pace: increasing 100% year over year to 10% of Internet traffic as of May of 2012. When it comes to mobile commerce, mobile is just 8% of ecommerce today. The story for mobile advertising is even more dramatic: while 10% of media is now consumed on mobile devices, just 1% of advertising targets mobile platforms. 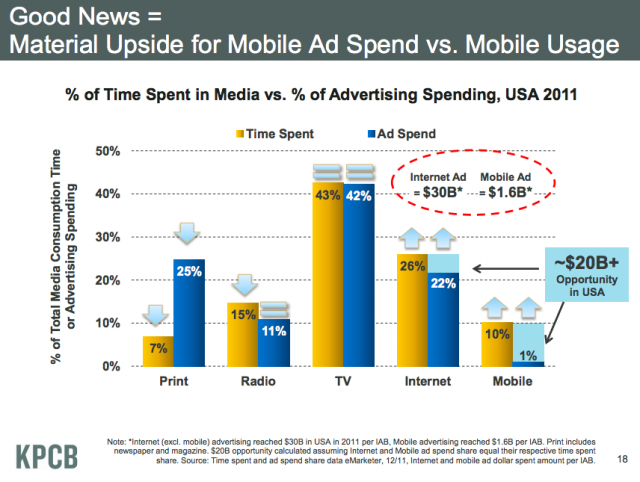 In comparison, print advertising represents 25% of spending but just 7% of media time spent. Mary points out that this is an increasingly pressing issue as the media landscape rapidly reshapes itself. In India, for example, total mobile Internet usage has already surpassed desktop internet usage. For marketers, this is a problem: the industry has been much more effective at driving marketing impact through desktop Internet consumption than through mobile channels.